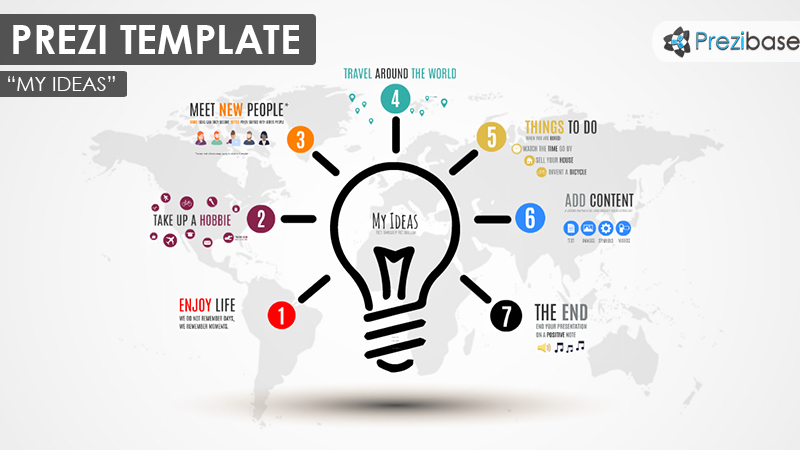 Prezi Presentation Template for presenting your creative and bright ideas. A light bulb icon and colorful circles lighting it up. Animate in the circle one by one. Number each idea and zoom for the details. Customize by adding as many ideas as needed. Good template for presenting a team project, brainstorming results or creative thinking, learning, school, education, pitching an idea. This entry was posted in Best Prezi presentation templates and tagged brainstorm, bulb, circles, colorful, colors, creative, creativity, details, idea, ideas, infographics, innovation, numbers, prezi template, prezi templates, project, school, sketch, teamwork, thinking, world.